Zex N2O Kit - Wet System - Pann Auto Performance - San Diego largest aftermarket automotive performance parts - What do you drive? A complete “Wet” nitrous system from ZEX. Everything is included for a safe, proper installation. Designed to work safely on stock type engines, but is also engineered to perform flawlessly on highly modified turbocharged and supercharged combinations. The ideal nitrous system for any fuel injected vehicle. All major components are factory pre-assembled inside the “Nitrous Management Unit”. Easy, plug and play, two-hour installation. 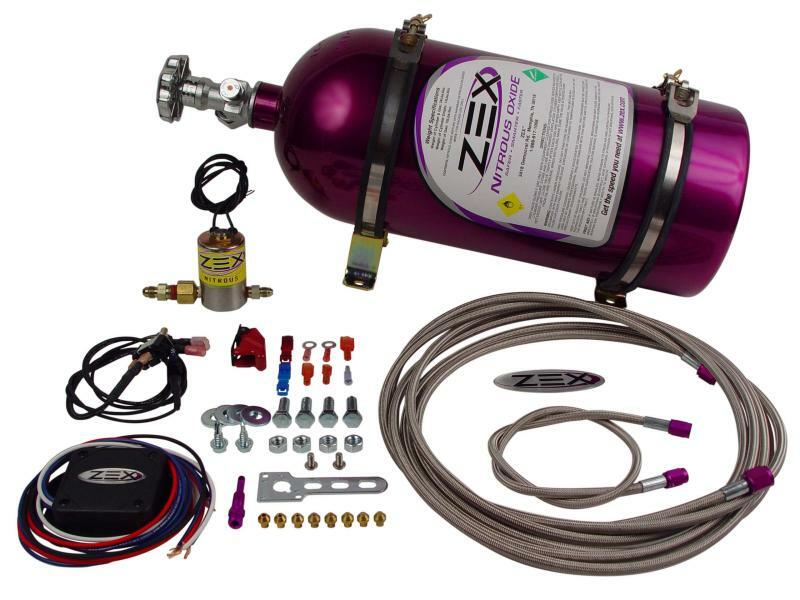 ZEX Nitrous Systems have an advanced, patented feature called “Active Fuel Control”. This feature monitors nitrous bottle pressure and adds or subtracts enrichment fuel so the engine never runs too rich, or too lean, when you engage the nitrous system. ZEX “Wet” nitrous systems activate at wide-open throttle using advanced electronics that monitor your engine’s throttle position sensor. This makes using your nitrous system very easy and reliable. Very straight forward installation. Helped me break into the 9’s! Thanks TH.